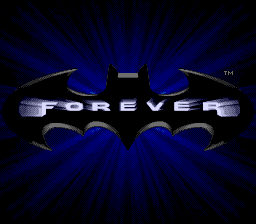 Batman Forever (バットマン フォーエヴァー) is a Batman game developed by Probe and published by Acclaim for the Sega Mega Drive. It is based on the 1995 movie of the same name. It should not be confused with the Game Gear version, which is entirely different, nor Batman Forever: The Arcade Game which is also based on this movie. Unlike previous entries in the series, Batman Forever uses digitised 3D graphics, similar to Mortal Kombat. The video game adaption of Batman Forever was created simultaneously with the movie, likely as the film was going through its post-production phase. Acclaim's development team in the US were given access to the movie's 70 sets, and would both record footage and take notes of the design before sending it off to the UK-based Probe Entertainment to be implemented in-game. Probe would then attempt to convert what assets they were given into backdrops, initially by scanning the footage into an SGI workstation and then by drawing rough guidelines, placing computer generated light sources and attempting to turn the results into 2D backdrops. The characters in-game were motion captured using the film's stuntmen against green screen, which again would be sent to Probe in video form. No members of the film's main cast reprise their roles for the video game, though their likenesses are used in promotional material. A limited edition release of Batman Forever was sold exclusively in branches of Woolworths in the United Kingdom. 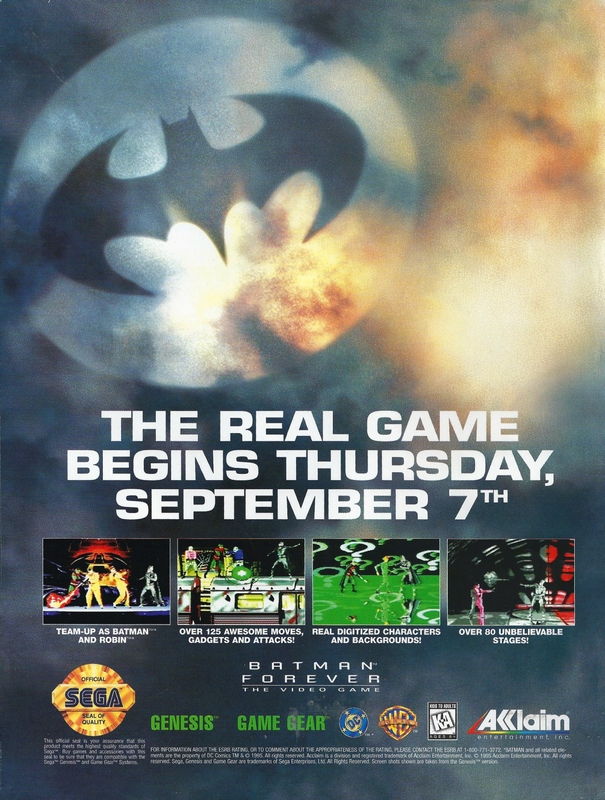 In addition to a boxed version of the game, the package includes a VHS cassette documenting how the game was made, a Batman Forever-themed notepad and stickers. The package is thought to have sold poorly, and has subsequently become a rare collectors' item, with second-hand copies reportedly selling as high as £10,000 online. Both Mega Drive and Super NES versions were available. Main article: Batman Forever (Mega Drive)/Magazine articles. Main article: Batman Forever (Mega Drive)/Promotional material.